I would eat these here or there. I would eat them anywhere. My daughter was delighted that there were a few strawberry oat bars left after I brought them to church to share as a morning snack. These fruity oat bars are also perfect for breakfast or as an afternoon snack. Really, there is not a wrong time of day to eat them; hence the first batch barely lasted 24 hours. Combine dry ingredients and then add margarine, oil, or butter. Use a fork or two knives to break apart the margarine, oil, or butter, and mix well, until even crumbles are formed. Press about two-thirds of the crumb mixture into the bottom of a 8-by-11-inch (20 cm x 28 cm) baking dish, or use a square dish to make thicker bars. Bake at 350 degrees F (180 C) for 15 minutes or until light golden. Remove pan from oven, cool slightly and spread jam over the oat crust. Top with remaining crumb mixture. Bake at 375 degrees F (190 C) for 20 minutes or until topping is golden brown. Allow the pan to cool for 30 minutes or longer before cutting the layers into bars. I’m sharing this recipe at Super Saturday Show & Tell , Saturday Dishes and Sweet and Savory Saturday. They are so easy to make. Another batch going to happen soon I think! What irresistible treats! I never met an oat bar I didn’t like! I love that these are infused with strawberries. Delish. I hope you get to enjoy them. The strawberries are definitely my favorite part! These are delicious oat bars! Perfect match with the milk! This looks really good! I love strawberrys and oats so together this is perfect! It really is a winning combination. The touch of rhubarb made it exceptionally good, but any jam would be delicious! Oh, these bars look delicious! Anything with oats and fruit, and I’m there! They are easy to make and enjoy! Thanks for commenting, and I hope you get to taste them soon! Yum! I love chewy bars! Thanks for sharing at Sweet & Savory Saturdays #28. Oh, I have to try your recipe soon, but make it gluten free. I hope it works! I’ll let you know how it turns out. Thanks for the idea! That would be fabulous! I think making these gluten free should work fine. It’s so nice to hear when someone makes a recipe I’ve shared! 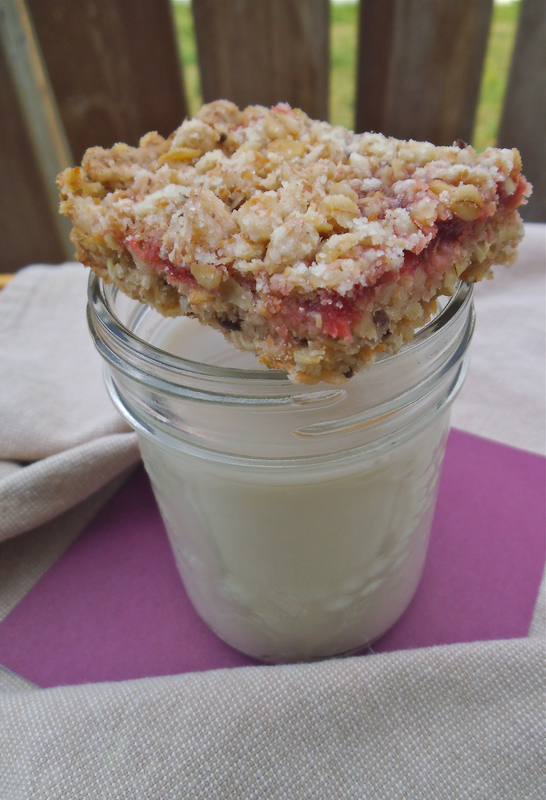 These Strawberry Oats bars would make a perfect snack or breakfast. I need a quick healthy breakfast in the mornings. Thanks for linking it up to Saturday Dishes. Thanks! I like that these bars are so easy to make and use simple ingredients from the pantry. I’ve missed the last couple of weeks of Saturday Dishes, so I am happy to be back to share and discover new recipes. 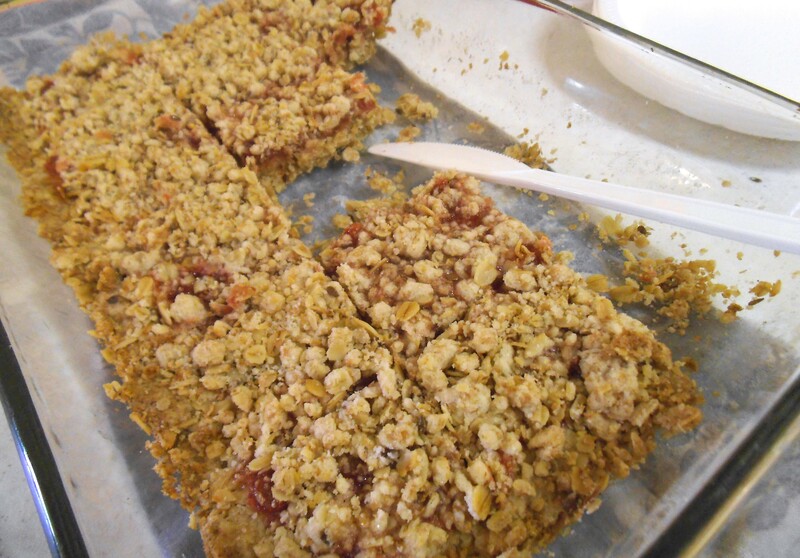 Thanks so much for sharing these Strawberry Oat Bars at Saturday Dishes! I’ve pinned them, and I’m planning to feature them at the party this weekend, so I hope you’ll stop by and grab a featured button! Have a great week! Thanks so much! I might have to celebrate by making a batch this week!